NASA Ames and SETI Institute research scientist Rosalba Bonaccorsi explains the history of Ubehebe Crater in Death Valley National Park. DEATH VALLEY, Calif. — As Susanne Douglas showed a group of visitors examples of microbial life of the type that might exist on Mars, she was asked whether humans or robots would be most likely to find indigenous Martians — if they exist. "If it wasn't a suicide mission to go to Mars, I think I would probably take the person," Douglas responded. "Maybe one day it will not be a suicide mission. But I think the robots are doing a darn good job." On this particular Saturday in late March, Douglas was leading a field trip to Badwater as part of MarsFest, a weekend-long outreach event that gave the general public a look at the analog research work being done by scientists in Death Valley. The third annual gathering was co-sponsored by The SETI (Search for Extraterrestrial Intelligence) Institute, the National Park Service and three NASA field centers — Ames, Goddard and the Jet Propulsion Laboratory. The event, which drew more than 500 participants, featured field trips to three different analog locations in the park as well as lectures at the Furnace Creek Visitors Center by Dr. Chris McKay of NASA Ames and other leading Mars experts. In addition to getting detailed tours of some of Death Valley's most interesting geological features by experts who study them for a living, there were also informal dinners with the scientists at the Corkscrew Saloon. Participants who camped out in the park also got an unobstructed view of the Milky Way at night under Death Valley's clear skies. The theme of the weekend was Death Valley sites that are analogs to Mars' Gale Crater, which NASA's Curiosity rover is now exploring. MarsFest participants were also treated to a tour of the Mesquite Sand Dunes, which are similar to the ones on the Red Planet. Susanne Douglas holds up a sample of microbial life that thrives in the harsh environments of Badwater Basin in Death Valley National Park. Dr. Rosalba Bonaccorsi, a research scientist at the SETI Institute and NASA Ames, led the final field trip on Sunday morning to Ubehebe Crater, located on the north end of the park. 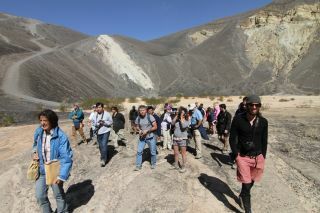 Thirty-eight hardy participants trekked down to the bottom of the crater, which is 600 feet (183 m) deep and 0.5 mile (0.8 km) around at the rim. Ubehebe formed at a time when Death Valley was a much wetter place. Hot magma rose up from the depths and reached groundwater, with the resulting explosions throwing out debris for miles around. Since its formation, the crater has been shaped by wind and rain into an excellent analog to Gale Crater on Mars, researchers said. Bonaccorsi said organizers were pleased with this year's MarsFest gathering. "I think that the event went very well. We were able to inspire and engage the general public," she said. "This year, in spite of the lacking of funding and shortage of supporting staff, MarsFest happened again, thank you to the support and the enthusiasm of the park. "Evaluation forms were distributed and it appears that overall people learned a lot more about the many Mars-like sites in the Death Valley National Park," she added. "Also, the event was greatly appreciated by the participants (public and scientists), and they want more and more for the future."